Older Beginner Students may also use this dress from time to time. 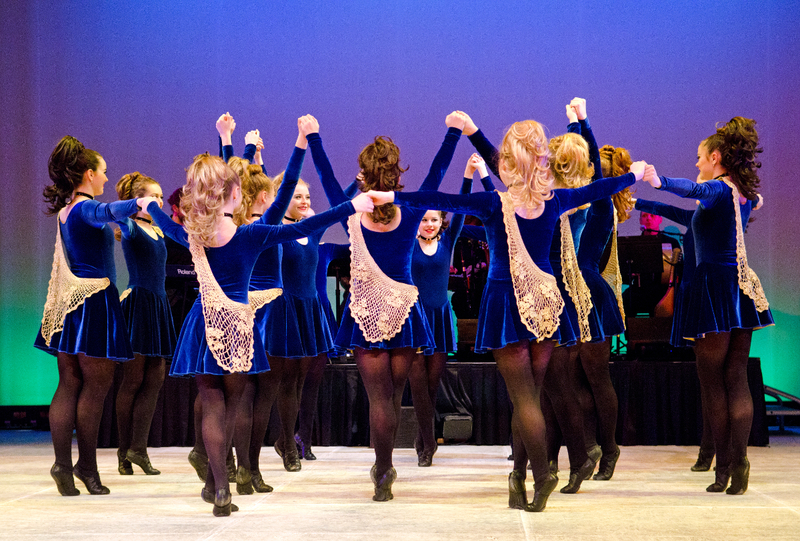 Advanced/Intermediate girls will have a blue velvet Performance Dress that fits them snugly. It is a leotard style dress. They are washable, cold water – gentle cycle, dry in low-heat. You must wash them between performances, having removed the cape and 2 pins. Victoria’s Secret has a wide shouldered sports-type bra that would not show with our neckline (no racerbacks, obviously). If the sports bras start to show, they will need to be pinned underneath to the dress. You are also responsible for your own black tights – they must be opaque, footed black tights – in good condition, without fading, holes, or runs. I recommend the Capezio Brand, #1815. Danskin #607 has a similarly styled version… No other store brands are allowed, sorry, as the “pantyhose” styles have different patterns that show at the thigh, or are not opaque enough. They can be found at most dance stores, I have purchased them from Grand Jete in St. Paul. They are usually around $11-$15. A back-up pair isn’t a bad idea either. Lastly, I would like to have every girl in the Novice – Open levels wear their hair up and back, in the ponytail style. The clip-on hair pieces are the easiest way to achieve it without bother. You can go long or short, straight or curly! The one we use is fro CREATIVE HAIR DESIGN in Roseville. It is the long, straight pony with a flip at the end (also reversible!). Please have them match your hair carefully; we would like to make them look as natural as possible. Age-appropriate make-up is welcome for public performances – we are on stage, under a dark tent after all. No rock star glam, please – we want you all to look like the beautiful young people you are. SHOES: Double check that you have them both before any performance, as your own well-worn shoes cannot be replaced. See that that laces are not breaking, and tape any holes. Please polish if very worn. Names in them aren’t a bad idea.